For the past 35 million years, rainwater has endlessly and relentlessly washed across the limestone escarpment. To varying degrees, the limestone will absorb water through its pores, but stone that has been damaged by ductile deformation is much more easily infiltrated. Faster still, water fills the cracks and fissures created by geologic strain, finding freshly broken calcium carbonate to wetten, and begin the process of chemical weathering called carbonation. Rain rainwater, it seems is more than just H2o. From the storm clouds above, H2o binds to with carbon dioxide (CO2) to form carbonic acid (H2CO3). And although carbonic acid is typically a mild acid when carried by the rainwater, it does slowly act as a solvent to the calcium carbonate (CaCO3) that holds the limestone together. This carbonation frees the carbonate from the calcium, and will metamorphose the calcium into calcium hydrogen bicarbonate Ca(HCO3)2, which technically only exists in solution. (1) The material that remains behind once it is no longer bound by bonds of the stone, is whatever impurities that were in the stone when it formed. This could include clay, fossils, feldspar which is the most common mineral on earth), among many other possibilities. Calcium carbonate is more soluble in colder temperatures. If you aren’t paying attention, this, along with so many other pieces of information might seem fairly unrelated. But like everything else, it is an important piece of the puzzle. It is all part of nature’s finely detailed engineering, where every element directly is related to, and influences the next. This fact that calcium is more soluble in colder temperatures folds beautifully together with the freeze-thaw fracturing of the limestone that I detailed in Limestone: Part 1.2. The acidic water enters the more porous limestone, where it then freezes. This exerts immense internal pressure on the rock, which causes it to split along the pores, can cause various types of fractures within the stone. Then when the acidic ice within the rock begins to melt, it erodes the stone along the fissures, being aided by the cold temperatures. 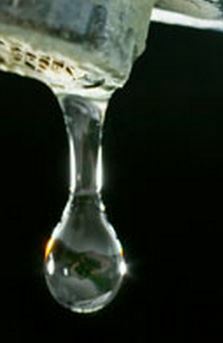 The more acidic the rainwater, the more minerals the groundwater can dissolve and be held in solution. Interestingly, because lime is alkaline (a base as opposed to acid) it naturally balances the ph of the water, and thus the soil, which is good for the health the vines. Visual observation: Les Grands Champs is located on the eastern edge of the village of Puligny. The land here is be quite flat, with less than a one percent grade. It sits at the foot of the 1er cru Clavillions (where the road turns to head up hill). Folatieres lies just above that, the bottom of which is denoted by the by the plot being replanted. 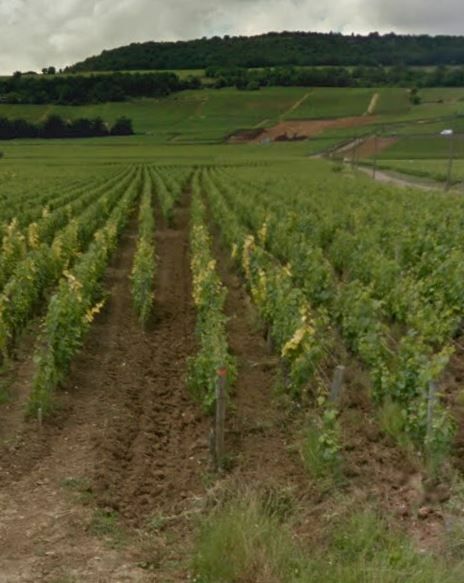 Every Burgundy vineyard that is considered to be great has at least some clay and some limestone in their makeup. But that is not surprising since clay, is the byproduct of the chemical weathering of stone. The silicate materials (essentially the building blocks almost all minerals) in the stone are metamorphosed into phyllosilicate minerals. Putting that more simply: after stone is eroded by acid, some of the weathered material (depending on what the stone was made of) is transformed into a material that will become clay – once it attracts the needed aluminum, oxygen, and water. Clays first forms at the site (in situ) of the stone that is being weathered, and this typically is a form of surface weathering. This new material is a primary clay, and sometimes referred to as a residual clay. These primary clays tend to be grainy, lack smoothness, and do not typically have qualities that are described as plasticity. As primary clays are eroded, (typically by water) and are moved to reform in another location, they are called transported clays. This transportation changes the clay’s properties; this is likely because the water carries the lighter, smaller gains together, away from the larger, coarser material that remains in the in situ location. When transported clay reforms, the reformation is called flocculation. This natural attraction that clays have toward homogeneous groupings, are due not only to their similar size but because they carry a net negative electrical charge, which the particles gain by adsorption. Adsorption is not to be confused with absorption, is like static-cling. Items are added, or adhered by an electrical charge, to the grains, not absorbed by the grains. In flocculation, particles are attracted to one another, by their uniform size (typically very small, under 2 micrometers), and shape (tetrahedral and octahedral sheets). These phyllosilicate sheets organize themselves, layering one upon another, like loose pages of sheet music. Between these silicate sheets, aluminum ions and oxygen are sandwiched. These elements bind together to form a clay aggregate, even in the confluence of water. Clay formations can carry with them, varying mineral components such as calcium, titanium, potassium, sodium and iron and other minerals, making them available to the vines. To say that the chemistry of clay gets very complicated, very quickly, is an understatement. Transported clay has plasticity, which primary clays do not. When a clay is very wet, beyond its liquid limit, (meaning the most water a clay structure can hold before it de-flocculates), the sheets slide apart, giving clay its slippery feeling. 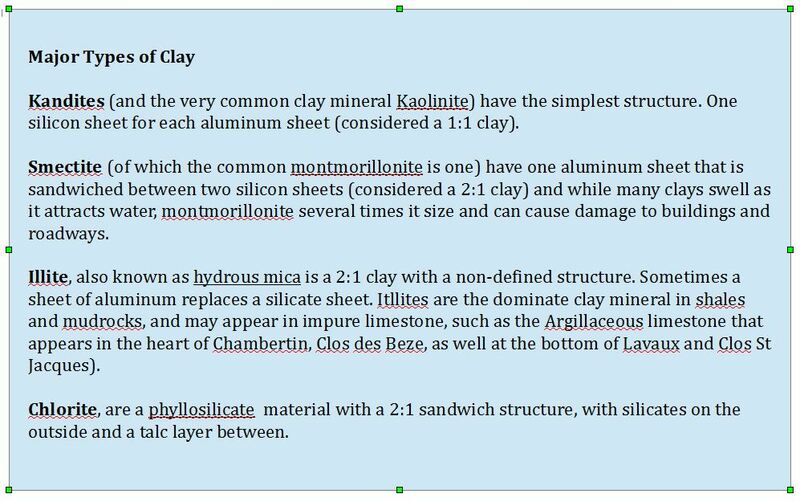 Any thick area of clay found at a location is likely to a be transported clay, as the adsorption characteristic of clay allows it to achieve significant mass. 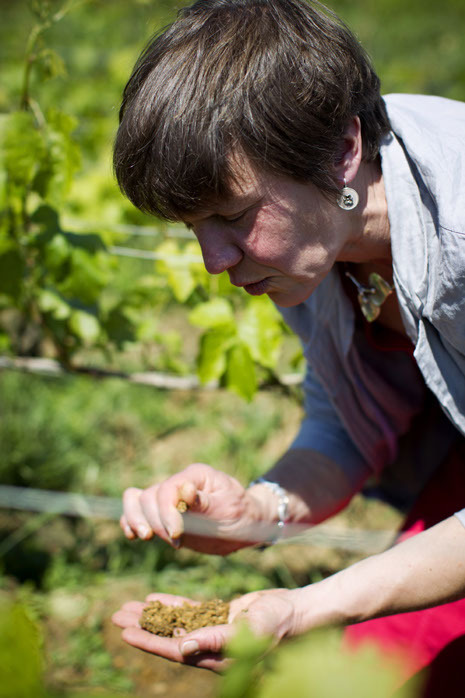 Francoise Vannier Petit, inspects the yellow ocher-colored clay in Puligny-Montrachet, Les Grands Champs. Clays get their pigmentation from various impurities. Brown clays get their color from partially hydrated iron-oxide called Goethite. This yellow ocher clay gets its color from hydrated iron-hydroxide, also known as limonite. Clay type, however, is not determined by its color, but instead by its chemical and material organization. I probably spent twenty hours trying to figure out what kind of clay eroded from limestone, before I realized that it would depend on what impurities were mixed into the calcium carbonate when it was brewed up during the Jurassic period. Limestone can produce any of the four families of clay. Kandites (of which Kaolin(ite) is a subgroup), are the most common clay type, because feldspar, which is the world’s most common mineral, metamorphoses into it. The other three clay groupings are smectite, illite, and chlorite. (4) Within these clay family groupings, there are 30 subtypes. As might be suggested by the example of the weathering of granite above, it is very common for different kinds clays reside adjacent to, or in layers with other clays. This layering of clay types is called a stacking sequence, and it can occur in either ordered or random sequences. Each are attracted to formations of its own type, by size weight, and electrical charge. 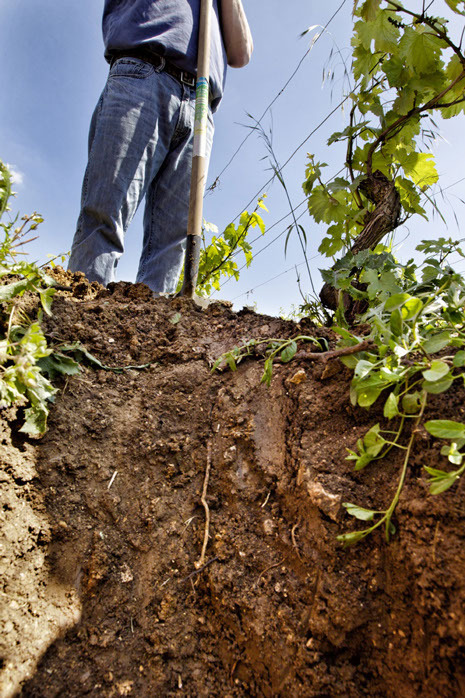 There are a number of significant benefits to the high levels of limestone in the soils of Burgundy. The world over, farmers make soil additions of agricultural lime (which is made from grinding limestone or chalk), in order to balance and strengthen their soils. These are additions that are unnecessary in Burgundy. Soil salinity is increased by the calcium bicarbonate that is released by chemical weathering of limestone. This increase in soil salinity (which raises the pH) of the soil, is cited as a condition for the flocculation of the clay, allowing the phyllosilicates (clay minerals) to bind together into aggregates. But of course, citing a high ph is required for flocculation (as I have seen written by several authors) this is the chicken or the egg debate. The flocculation requires a low pH environment to occur because it creates that environment in process of its development. Lime additions to agricultural lands are also beneficial in that it increases soil aeration, which in turn improves water penetration. The calcium loosened soils allow for better root penetration, and because of that root growth is improved. Additionally, agricultural lime strengthens vegetation’s cell walls, increases water and nitrogen intake, and aids in developing enzyme activity. Too much lime (and its accompanying salinity) in the soil, however, can be lethal to the vines, and various rootstock has been identified as being more resistant to the effects of high levels of limestone in the soil than others. This loosening of soil by addition of lime/calcium carbonate is caused by the disruption of the alignment of the clay particles. Rather than doing a poor job paraphrasing an already excellent article from soilminerals.com, called “Cation Exchange Capacity,” which will I quote below. To put the article in a frame of reference, it explains to farmers interested in organic and biodynamic farming, the proper mineral balance for healthy soils. These are conditions often exist naturally in the best sections of the slope in the Cote d’Or. On construction sites, mud is a problem, and lime is the solution. The soil strengthening properties of lime is well known by the construction industry. It is used as a soil stabilizer in the construction of buildings and roadways, as well as being used to stabilize wet ground to improve the mobility of trucks and tractors. In the vineyard, soils with high levels of limestone provide the good porosity, soil structure, and drainage to clay soils, and as this construction advertisement depicts, the same for mud/dirt soils as well. Lime is also the binding agent in cement. The first known use of lime in construction was 4000 BC when it was used for plastering the pyramids, and later the Romans extensively used lime in the preparation of mortar for various constructions. They found that mortars prepared from lime, sand, and water, would harden to a man-made limestone, with exposure to the carbon dioxide provided by the air. This, of course, sounds very familiar, knowing the formation and chemical weathering of stone. (1) I should note, that within the span of this short paragraph, carbon has seen several forms: in the air (in carbon dioxide CO2), as an acid (in carbonic acid CO3) carried by water, in stone as calcium carbonate CaCO3, as a mineral bi-product (as calcium bicarbonate Ca(HCO3)2 which exists in liquid solutions. This is all part of the carbon cycle, where carbon is regenerated in the air we breath, the water we drink, the earth we grow our food in. 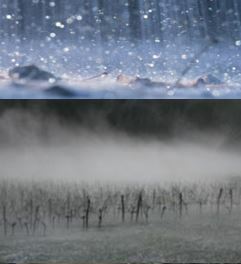 (2) The fact that CO3 is now carried by water, is important in terms of vineyard development. (3) Kaolinite clays are the type used in pottery. (4) As Granite was the primary stone formation in the region prior to the development of limestone, it is likely that Kaolinite and Illites are the most common clay families in Burgundy today.